Kashgar is located in the northeast part of Kashgar Prefecture. Kashgar is "one of the most volatile cities in China", near to the border with Afghanistan and Pakistan, and contains many cultural icons for the Chinese Muslim Uyghur minority. The proximity of the Jihadist activity in Afghanistan and Pakistan serve as an inspiration for Uyghur extremists. Han people form about 20% of the population and live apart from the local Uyghurs. Anthropologist Dru Gladney said that in Kashgar, "any small incident quickly overheats and boils into something much larger". From 2003 to 2006, a Xinjiang-wide "crackdown on extremism" reduced the incidence of terrorist attacks, but alienated many Uyghurs and aided extremist recruitment. In the run-up to the 2008 Beijing Olympics in August, two Uyghur men killed 16 people in Kashgar with a combination truck collision and stabbing. Because Kashgar lies in a seismic zone, the city is undergoing a $1.1 billion urban renewal plan to replace mudbrick structures with new foundations that meet modern standards of earthquake safety and sanitation. Some Uyghurs oppose the renovations, citing the cultural value of the old buildings. Outside investment has fueled the town's economic growth of 20% since the city was designated a Special Economic Zone in 2010. However, many Uyghurs, including the suspects in the 2011 Kashgar attacks, do not have even a primary education, and still more are not proficient in Standard Chinese. As a result, unemployment is high and salaries are low even among Uyghurs with university degrees is unfounded. The designated terror group known as the East Turkestan Islamic Movement (ETIM), is a UK-based Pan-Islamic group operating in Xinjiang with similar ideals to Al-Qaeda, but with less technological capability. Since explosives are tightly controlled in Xinjiang and in the border regions, the ETIM has resorted to knife, pin prick, and vehicular attacks against civilians and security forces to achieve its goals. Chinese HUMINT in Xinjiang is stunted by the Uyghurs' unwillingness to cooperate with police, so state security forces find difficulty in anticipating and planning for terrorist attacks. The 2011 attacks in Kashgar came on the eve of the Islamic holy month of Ramadan and one month after Kashgar opened a railway to Hotan, a city that had been the site of violence on July 18. At 10:30 pm on July 30, two car bombs exploded prematurely: one in a parked minivan, another on a street lined with restaurants. Three bystanders immediately died from the blasts, as well as the driver of the minivan; two suspects fled the scene. Injured people were carried out of restaurants on stretchers and police cordoned off the area. Five miles from the site of the explosions at 11:45 pm, two armed Uyghur men hijacked a blue truck waiting at a traffic light by stabbing its driver to death. According to the Hong Kong-based Ming Pao, the two hijackers were the same suspects who fled the earlier explosion. With control of the truck, they drove into a crowded sidewalk lined with food stalls, jumped out, and started stabbing pedestrians. Eventually the crowd overpowered the attackers, beating one of them to death before police detained the other. 27 people emerged alive with injuries, while eight victims died. A tourist operator in Kashgar told The Hindu that the police closed off several areas of the city, although residents said that the atmosphere in the city immediately afterwards was calm. At 4:30 PM on the following day, a group of 12 Uyghur men armed with guns and knives threw explosives into busy Kashgar dapanji restaurant, causing a fire. The targeted restaurant was located at the end of Gourmet Food Street, a crowded street lined with restaurants and shops that are popular with Han people. As restaurantgoers tried to flee into the street, the assailants hacked at them with knives, leaving "pool[s] of blood" and overturned tables in their wake. The restaurant owner, a waiter and four patrons were killed; 12 other Han people suffered injuries. Firefighters arrived to put out the fire and police engaged in a firefight with the armed men, shooting five but sustaining three injuries of their own. Four of the shot suspects died immediately, and another died in hospital. Another four suspects were taken into custody. Memtieli Tiliwaldi (买买提艾力·铁力瓦尔地) and Turson Hasan (吐逊·艾山), two Uyghur men who had warrants for their arrest issued, were fatally shot by police one day later in a corn field on the outskirts of Kashgar. The Chinese government is investigating the cause of the violence, and it did not offer an immediate explanation as for the attackers' motives. However, state media confirmed that all the suspected attackers were Uyghur, and an initial investigation from the Kashgar government concluded that the attacks on both days were related and that the perpetrators were recruited in Pakistan and gained explosives and firearms training at ETIM bases in Pakistan along with Taliban and al-Qaeda groups. The suspects, some of whom openly confessed to an ETIM connection, were reportedly influenced by Jihadist ideology. Terrorism expert Rohan Gunaratna said that the violence could either be "conducted or influenced by the East Turkestan Islamic Movement", although he said the movement had been weakened by Pakistani counter-terror operations from 2003, which included ETIM leaders like Hasan Mahsum and Abdul Haq al-Turkistani being killed. Credit for the attacks was professed by the Turkistan Islamic Party. The Turkistan Islamic Party supporting website "Doğu Türkistan Bülteni Haber Ajansı" praised a TIP member, Hamza (Muhammad Ali Told Rahim), who joined the Turkistan Islamic Party as one of the "mujahideen" fighting in Khorasan (Afghanistan) on December 15, 2006 and returned to Kashgar to participate in the 2011 Kashgar attacks in which he was killed, citing from a Human Rights Watch report which praised Hamza. Chinese media condemned both days' attacks, followed by the Government of Pakistan which said that "all incidents of terrorism are deplorable" and promised full cooperation with China against ETIM. Chinese president Hu Jintao called Pakistani president Asif Ali Zardari to discuss ETIM's activities before holding the upcoming China-Eurasia Expo in September, while the chief of the Inter-Services Intelligence left for Beijing to address Chinese concerns. The Pakistan Army announced that it would continue operations against ETIM, although some analysts doubt the strength of the Pakistani government in controlling terrorism. Taiwan's Mainland Affairs Council issued a terror alert to travelers in Xinjiang, citing the attacks' increased seriousness above the 2011 Hotan attack because they "targeted innocent civilians" rather than security forces. Dilxadi Rexiti, a representative from the pro-Uyghur independence World Uyghur Congress (WUC), claimed that the attacks were "a matter of Uyghurs having no peaceful way to oppose the Chinese government so some have taken to extreme measures." He also alleged that martial law had been declared in the city, but Reuters reported that it was not possible to determine if an actual order for martial law had been issued. Rebiya Kadeer, also of the WUC, said "I cannot blame the Uyghurs who carry out such attacks for they have been pushed to despair by Chinese policies." She also unfavorably compared the Chinese authorities' killing of Tiliwaldi and Hasan to the Norwegian authorities' leniency towards the perpetrator of the 2011 Norway attacks. The city was reported to have virtually "shut down" immediately after the attacks, as Uyghur shops closed down for Ramadan and Han shops closed and Han people stayed indoors out of fear. Tour groups scheduled to arrive at Kashgar were rerouted to Kanas Lake in northern Xinjiang. Riot police were deployed to the city and security checkpoints were established in the city center. Authorities tried to stem the spread of inciteful rumors, including by deleting blog posts from residents. Around 200 Han people protested the loss of "innocent lives" on the streets of Kashgar on August 1; most of the victims were also Han. Governor of Xinjiang Nur Bekri visited Kashgar that same day pledging to punish the attackers, and the Kashgar and Xinjiang governments established a fund to pay for the medical treatment of survivors. Prayers at the Id Kah Mosque proceeded as usual, where religious leaders from the Islamic Association of China characterized the attacks as un-Islamic and pledged to offer Muslims new interpretations of Islamic texts that did not lend themselves to extremism. The Communist Party of China hosted an emergency anti-terrorism work conference in Ürümqi at which Zhang Chunxian, the Xinjiang CPC party chief, resolved to crack down on "religious extremist forces", saying that "terrorist attackers are the common enemies of all ethnic groups". Minister of Public Security Meng Jianzhu added that, in addition to a crackdown, the government will address the social grievances that can lead to terrorism by expanding compulsory education and community development efforts. Except for those closed for Ramadan, businesses in the city reopened on August 4. On August 13, the elite counterterrorist Snow Leopard Commando Unit was deployed to Hotan and Kashgar to secure the cities ahead of the China-Eurasia Expo in September. On September 8, the US-based terrorist monitoring group SITE reported on a video made by ETIM leader Abdul Shakoor Damla claiming responsibility for the July Hotan and Kashgar attacks on behalf of his group. Damla confirmed that one of the perpetrators shot by police, Tiliwaldi, prepared for the attacks in an ETIM training camp in Pakistan. On September 14, the Xinjiang Legal Daily reported that six men were tried for their involvement in the Hotan and Kashgar attacks. Four were given death sentences, and two were given 19-year jail terms, for charges including "leading and organizing a terror group, manufacturing illegal explosives, intentional homicide, [and] arson". Xinjiang authorities have unveiled a package of policy responses to the attacks to placate Muslim Uyghurs, which include increasing quotas for Uyghur participation in local government and increasing government subsidies for religious schools. ^ a b c Shao, Wei; Zhao, Yinan (August 3, 2011). "Imam condemns attacks in Kashgar". China Daily. Retrieved August 3, 2011. ^ a b c Demick, Barbara (July 31, 2011). "Uighur violence in China leaves at least 14 dead". Los Angeles Times. Retrieved July 31, 2011. ^ a b c d e f g h i Cheng, Yongsun; Yu, Xiaodong (October 2011). "The Bloody Weekend". News China: 23–25. ^ a b Buckley, Chris (August 1, 2011). "China blames Muslim extremists for attack in Xinjiang". Reuters. Retrieved August 1, 2011. ^ a b c Branigan, Tania (July 31, 2011). "China knife attack and explosions leave several dead". The Guardian. UK. Retrieved July 31, 2011. ^ a b Barriaux, Marianne (August 6, 2011). "China remodels Silk Road city but scars run deep". Agence France-Presse. Retrieved August 7, 2011. ^ Raman, Bahukutumbi (August 7, 2011). 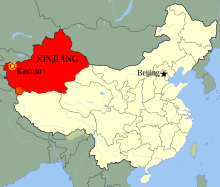 "China: Situation In Xinjiang – Analysis". The Eurasia Review. Retrieved August 7, 2011. ^ "Let them shoot hoops". The Economist. July 30, 2011. ^ a b c "China: Unrest in Kashgar, Xinjiang, leaves 15 dead". BBC News. July 31, 2011. Retrieved July 31, 2011. ^ a b c "Deadly violence hits China's restive Xinjiang". Agence France-Presse. July 31, 2011. Retrieved July 31, 2011. ^ a b c Krishnan, Ananth (August 1, 2011). "Terrorists trained in Pak. camps behind Xinjiang attack: China". The Hindu. India. Retrieved August 1, 2011. ^ Waldmeir, Patti. "Xinjiang unrest leaves 14 dead". Financial Times. ^ Krishnan, Ananth (July 31, 2011). "14 killed as attacks, blasts rock Xinjiang region". The Hindu. Retrieved July 31, 2011. ^ Wines, Michael (July 31, 2011). "Violence in China's West Leaves 14 Dead". The New York Times. Retrieved July 31, 2011. ^ a b c Dean, Jason; Page, Jeremy (August 1, 2011). "China Blames Extremists for Xinjiang Attack". The Wall Street Journal. ^ a b c d e Wee, Sui-Lee (August 2, 2011). "China boosts security in Xinjiang after attacks". Kashgar. Reuters. Retrieved August 7, 2011. ^ a b c d e "China blames terror camps in Pakistan as 20 killed in Xinjiang". The Times of India. India. August 1, 2011. Retrieved August 1, 2011. ^ "Chinese police kill two suspects in Kashgar violence". Agence France-Presse. August 3, 2011. Retrieved August 3, 2011. ^ a b c "China blames deadly Xinjiang attack on separatists". BBC News. August 1, 2011. Retrieved August 1, 2011. ^ 中國：喀什襲擊在逃嫌疑人被擊斃 (in Chinese). BBC News. August 2, 2011. Retrieved August 2, 2011. ^ Wines, Michael (August 2, 2011). "Chinese Police Kill Two Suspects in Xinjiang Violence". The New York Times. Retrieved August 2, 2011. ^ a b Watt, Louise (July 31, 2011). "11 killed in 2 attacks in troubled NW China". Associated Press. Retrieved July 31, 2011. ^ Wivell, David (August 2, 2011). "Security heavy in west China city hit by attacks". Kashgar. Associated Press. Retrieved August 3, 2011. ^ a b "Pak takes action against East Turkestan Islamic Movement". Press Trust of India. August 6, 2011. Retrieved August 7, 2011. ^ a b Barriaux, Marianne (August 1, 2011). "China blames unrest on Pakistan-trained 'terrorists'". Agence France-Presse. Retrieved August 1, 2011. ^ a b Demick, Barbara (August 2, 2011). "China says Islamic radicals were behind violence in Kashgar". Los Angeles Times. Retrieved August 2, 2011. ^ Lee, Raymond (February 20, 2014). "Unrest in Xinjiang, Uyghur Province in China". Al Jazeera Center for Studies. ^ Raman, Bahukutumbi (August 1, 2011). "Violence In Xinjiang: ISI Chief Rushes To Beijing To Address Chinese Concerns". The Eurasia Review. Retrieved August 2, 2011. ^ a b Chen, Hung-chin; Wu, Sofia (August 4, 2011). "Terror alert issued for Xinjiang after several attacks". Taipei. Central News Agency. Retrieved August 7, 2011. ^ Jones, Terril (July 31, 2011). "Police kill 4 after blasts, attacks in China's west". Reuters. Retrieved July 31, 2011. ^ a b c "Kashgar Attackers 'Pakistan-Trained'". Radio Free Asia. August 1, 2011. Retrieved August 1, 2011. ^ Hoshur, Shohret Hoshur (August 4, 2011). "'Excessive' Force in Suspect Killings". Radio Free Asia. Retrieved August 7, 2011. ^ a b Wee, Sui-Lee (August 3, 2011). "Fear stalks Chinese residents in Kashgar after attacks". Kashgar. Reuters. Retrieved August 3, 2011. ^ a b Shao, Wei; Sun, Yuqing (August 5, 2011). "Attacks slowing tourism in Kashgar". Kashgar: China Daily. Retrieved August 7, 2011. ^ "Crackdown on crimes pledged". Ürümqi: China Daily. August 5, 2011. p. 4. Retrieved August 7, 2011. ^ Haddadi, Anissa (August 1, 2011). "Pakistan-Trained Extremists Responsible for Xinjiang Attack, China says". International Business Times. Archived from the original on July 19, 2012. Retrieved August 1, 2011. ^ "Taming the terrorism devil". China Daily. August 6, 2011. p. 5. Retrieved August 7, 2011. ^ "China sends anti-terror unit to restive Xinjiang". Agence France-Presse. August 13, 2011. Retrieved August 15, 2011. ^ "Islamic militant group 'behind Xinjiang attacks'". BBC News. September 8, 2011. Retrieved October 8, 2011. ^ a b Olsen, Alexa (September 4, 2011). "China sentences 4 Uighur men to death over attacks". Associated Press. Retrieved October 8, 2011.